At a press conference organized by Jane Place, tenants fight eviction from affordable units in the publicly subsidized American Can Company apartment complex. Hardly a week goes by without Jane Place Neighborhood Sustainability Initiative—Jane Place, as we’re commonly known—receiving a panicked call or email from yet another tenant in New Orleans facing eviction because a landlord is converting their apartment into a short-term rental. This conversation has become an all-too-common aspect of our work. Jane Place was founded by activists to fight displacement and despite a recent spate of lies and unfounded accusations, that’s why we’re working to ensure short-term rentals don’t continue to push residents out of our city. The first community land trust in New Orleans, we began our work 10 years ago out of the concern that renters and low-income homeowners were being excluded from the post-Katrina redevelopment of New Orleans. Over the past decade, we’ve done a lot of work to fight for affordable housing in our city, but we’ve gotten the most attention of late for our advocacy around short-term rentals (STRs). Our opposition to the unchecked growth of whole-home rentals is grounded in a principled anti-displacement stance and we have been completely transparent in sharing the political and economic analysis that got us there. And yet STR operators continue to make false accusations about our motives and our funding. The falsehoods are repeated on social media, at public events, and, recently, in an editorial published in the October issue of the New Orleans Tribune. Jane Place is dedicated to development without displacement. We advocate building safe, permanently affordable housing that helps low- and moderate-income residents remain in an increasingly pricey New Orleans. Detractors have tried to discredit our work by claiming that we blame the New Orleans housing crisis in its entirety on STRs. We don’t. The reality, as we have stated repeatedly, is that unrestricted STRs are one factor — albeit an important one — in New Orleans’ housing crisis. The foundations of that crisis were laid over the past decade by the public and private sectors alike. We will not tolerate being libeled or slandered, especially by those directly profiting from the STR piece of the housing crisis. A housing market is an ecosystem. The cumulative impacts of many decisions — from the demolition of public housing, to unjust recovery planning, to the overproduction of luxury housing, to the removal of thousands of units of housing by STR speculators — have driven the city into crisis. We are happy to talk in-depth about our analysis and our policy recommendations and how they will impact the city, but we will not tolerate being libeled or slandered, especially by those directly profiting from the STR piece of the housing crisis. We believe in a shared-equity model, whereby residents can benefit from the housing security and stability offered by homes held in a land trust to insulate them from market pressures and keep them permanently affordable. 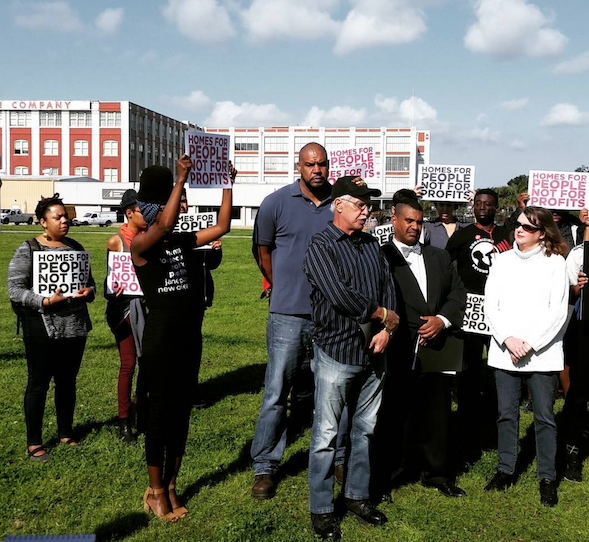 Our primary goal as an organization is to build homes for low and moderate-income residents of New Orleans and to fight development patterns that gentrify neighborhoods and force people out of our city. We opened the first permanently affordable apartment complex in 2016, a four-plex in MidCity, financed through funding from the City of New Orleans, national foundations, and local partners. As a non-profit housing developer and housing rights advocacy organization, Jane Place makes no profit off the housing we develop. The organization survives on the labor of two paid staff members and the unpaid labor of a volunteer board backed by donors who believe in our mission. Jane Place stepped into the debate on STRs because we saw friends and community members being displaced and watched home prices in various neighborhoods skyrocket as speculators paid over-market prices for property they could rent to tourists at exorbitant rates. Our report, Short-Term Rentals, Long-Term Impacts, details how STRs exacerbate displacement with meticulous data, all of which is accessible to the press and public (a standard STR platforms have yet to meet). Our report and our research on best practices around the nation informs an ordinance we have proposed, called Residents for Ethical and Sustainable Tourism (REST). The ordinance calls for tying STR permits to valid homestead exemptions. It would allow a homeowner to rent out a room in the house or an entire unit of housing such as the other half of a double, provided the homestead-exempted owner resides full-time on the property. By promoting and protecting home sharing, the REST ordinance would slow displacement in our neighborhoods by ensuring that STRs are run by neighbors and not by speculators,. New Orleans homeowners will face less competition for guests and will enjoy a greater overall return on home sharing; a greater proportion of tourist dollars would be netted by locals. In commercially zoned areas, such as the Central Business District, where large swaths of apartment buildings have been converted into STR towers, Jane Place calls for a one-to-one match of STR permits to affordable housing units within developments. This would bring hundreds of affordable housing units online in the CBD, allowing New Orleanians to live close to the restaurants, music clubs, hospitals and hotels where they work. Jane Place has never accepted money, worked with, or spoken with any pro-Confederate monument groups or individuals, and we are sickened that the Alliance for Neighborhood Prosperity would stoop to insinuating that we are working with white supremacists. STR operators repeatedly claim online and at public events that Jane Place has received money from hotels for our work. These statements are, simply put, lies. We say firmly and without qualification that Jane Place has never received funding from the hotel industry, from lobbyists working on behalf of the hotel industry, from big developers profiting from STRs, or from big developers, period. We did not invite representatives from the hotel lobby to the table when we drafted the REST ordinance alongside community members. We fight for housing access and affordability on behalf of New Orleanians, not on behalf of corporations. The reality is quite different: Jane Place has never accepted money, worked with, or spoken with any pro-Confederate monument groups or individuals, and we are sickened that the Alliance for Neighborhood Prosperity would stoop to insinuating that we are working with white supremacists. Jane Place abhors all forms of bigotry, and we support ongoing movements to remove all symbols of white supremacy in New Orleans. In an editorial titled “Profits, Not People are at the Center of the STR Debate,” the New Orleans Tribune’s October edition conveyed the more detailed but equally false claim that Jane Place received $400,000 in 2017 from unspecified sources. Again, the reality is quite different. Total donations for 2017 came to $126,000, less than a third the imaginary number reported by the Tribune. We also received $56,000 in grants from local and national foundations for the creation of permanently affordable housing and to support the monthly Tenant Assemblies where we offer pro bono legal support to renters who are facing housing issues. The $126,000 in donations for the year came from more than 100 individuals giving an average of $100 apiece. We have shared this information with the New Orleans Tribune and requested that they run a correction, but we have yet to receive a response. We would also like an apology from the Tribune for spreading falsehoods. Though America has grown accustomed to Big Lies and Fake News, we at Jane Place are deeply dismayed by the continuing effort by pro-STR forces to spread falsehoods about our work, in the hope of undermining our reputation and effectiveness as a nonprofit. Jane Place members and donors share a vision for New Orleans in which development does not mean gentrification and displacement; residents are able to access healthy, affordable homes in well-serviced neighborhoods, and New Orleanians are not systematically displaced so speculators can squeeze more money out of the inequitable tourism economy. We need many solutions to fix the housing crisis, not just STR reform. We need mandatory inclusionary zoning, increased investment in permanently affordable housing, real solutions for escalating property taxes for low-income homeowners, and reformed eviction laws. We cannot win this fight alone. 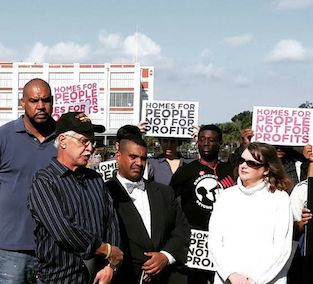 Join us to build a New Orleans that has homes for all, not just the privileged few. Breonne DeDecker is the Program Manager for Housing and Advocacy for Jane Place Neighborhood Sustainability Initiative. She was the principal researcher and author of Short Term Rentals, Long Term Impacts. She has been researching and monitoring STRs in New Orleans for the past three years. A full list of JPNSI’s funders can be found on the Jane Place website.